Social media is more than just a tool you can use to connect with friends or share your family pictures. For businesses, social media is an essential channel to attract and retain customers, and has become an integral part of effective marketing programs - heck, it can change the outcome of a major election. Just think what it can do for you. It gives you a platform to share you brand, messaging, and content, while reaching both wide and targeted audiences. So how can your organization best use social media as a marketing platform? What is your main social media goal? Your social media marketing efforts should always align with your overall business objectives. 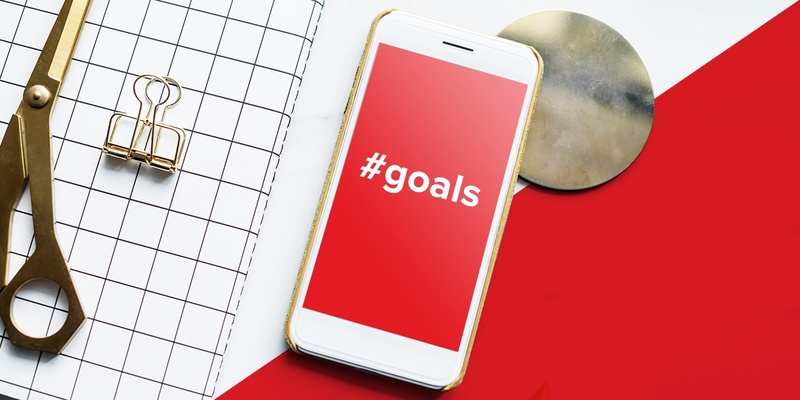 While there are many goals you can set to measure the success of your social media efforts, including increasing reach and interactions, in this guide we’ll be going over how to lead potential clients to your website. Once they’re there, you can encourage the visitor to complete a preferred action, whether that’s to make a purchase, request more information or download a white paper. Now, let’s dive into how you can attract more prospects to your website through social media. Segmenting your target audience is an essential part of reaching your social media goal. In a competitive market, you can’t appeal to everyone. So in order to bring value to your prospects and customers, it’s critical to really define who you’re targeting, and then share the right content via your social media channels. Once you have your target audience in place, you need to dig deep into their social media behaviours. Which channels are they more engaged on? Facebook, Twitter, LinkedIn or Instagram? What kind of content are they looking for on social media? Is it a blog link, a Q&A series, market statistics, or an industry report? In the end, the more you understand your target audience, the more value you can bring to them. If you do it right, they’ll be more likely to keep coming back to your website again and again. It’s a win-win situation for both you and your customers. So what’s the next step? When you have a better understanding of who your target audience is, you can show them ads that are relevant to their interests and challenges. You only pay when people click on your ads. So targeting the right audience means you’ll only show your ads to people who are the most likely to click and visit your website. 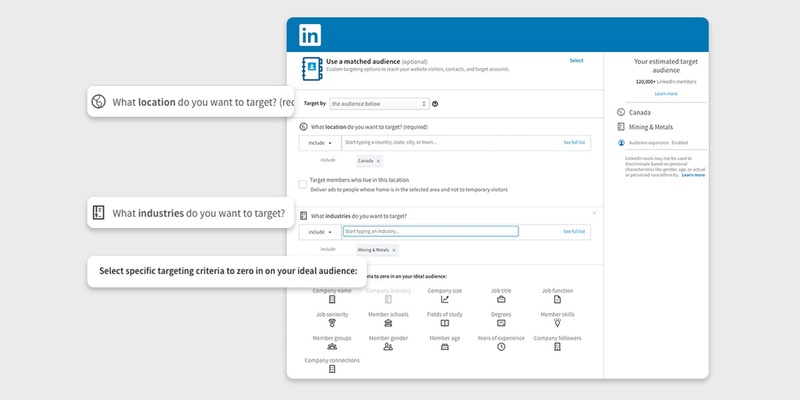 The most popular social media platform for B2B businesses, LinkedIn, also allows you to show ads to your target audience based on their company, industry, skills and job titles. On top of that, if you already have email lists, you can upload them to LinkedIn and target your ads to the people on your list. Your ads can contain links to blog posts, videos, case studies, and more. You can also use ads to generate leads by bringing people to a white paper landing page or a webinar sign up page. You may ask: What if I don’t have a budget for paid social ads? Don’t worry! Organic social media efforts are more important than ever. Earlier this year, Facebook announced they will show more content from trusted sources over other types of content. This is a response to the increase in fake news within the network. This big change doesn’t mean you should stop marketing on social media. It means that your organization should provide value to the customer every time they interact with you on social media. Then you can build trust over time. With the trust of your social media network and quality content, you can make sure that you are seen as an expert and credited source for information. But how exactly can you provide value to your social media followers? You probably saw that in the first version, the copy wasn’t speaking to our target audience. It just sounded like a bland announcement that didn’t provide value to anyone. But when we worded it differently, we spoke to what our target audience was looking for. We also included a call-to-action directing them to our case studies page where they could find more of the information they wanted. There’s lots of advice out there on the types of content you should post on each social media channel. But at the end of the day, what works for another business might not work for yours. So it’s important to look at your social media analytics over time to see what content works well for your target audience. Note that different content might perform better on different channels, based on how your audience interacts there. For example, our Facebook audience tends to engage more with fun and design-focused content, whereas our LinkedIn audience likes to see statistics and case studies. So how do we do it here at Red Rocket? We used to mostly post third-party article links (to blogs, news stories, and articles on other websites) along a few of our own blogs. However, the third-party articles received way fewer interactions than our own original content. So we decided to better appeal to our target audience, by showing them more of the content they liked best. So we starting posting more original content like blog posts, case studies, posts celebrating holidays of all kinds, client testimonials, happenings around the studio, and social events we attend. 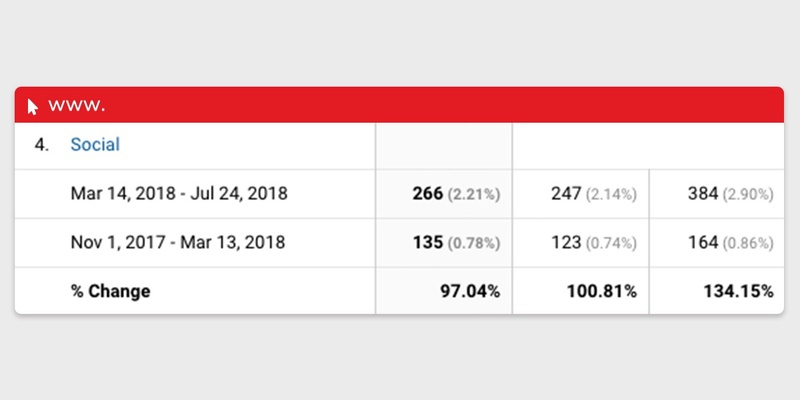 Since we started adding more variety to our social media content, we saw a 134.15% increase in social media traffic to our website. Step 4: Don’t Forget About Design! Anything you post on social media is way more engaging when you use a photo or illustration to support the text. According to a study by HubSpot, photo posts on Facebook generate 53% more likes than text-based posts. The use of imagery gives you a higher chance of catching people’s attention. As a creative studio, we take extra care with how our designs are presented through social media. We make sure our graphics are on-brand and showcase what we want to say at the same time. 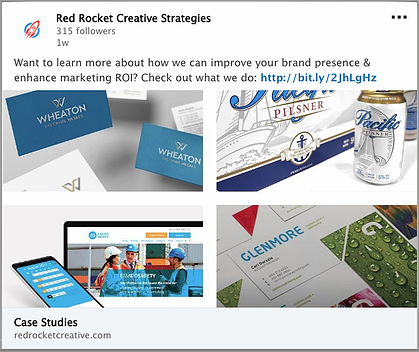 Include your logo and branded banner art on your social media profile. Your social media profile is similar to how you present yourself on a first date. First impressions are essential in both scenarios. You want to make sure your profile is completely filled out, has a branded logo, banner art, and a company bio that summarizes what your organization does. Don’t forget to include your website link so people can click to your website from your social media channels. A good example of an on brand social media design is the graphic we made for this year’s Mother’s Day social media post on Facebook. 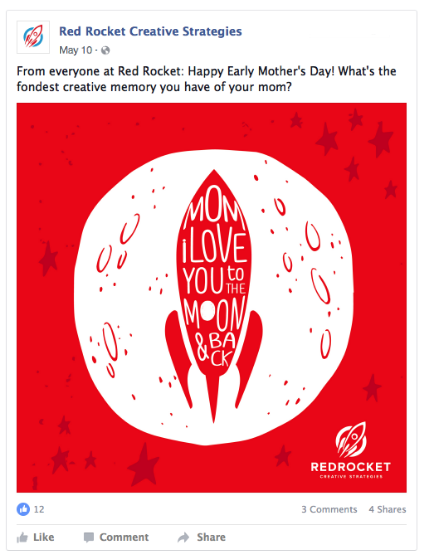 We integrated our rocket icon into the Mother’s Day phrase “Mom, I love you to the moon and back”. This graphic skillfully showcases our brand. Well-designed social media ad graphics are critical in grabbing the attention of social media users. Before April of this year, Facebook limited the amount of text that could appear on Facebook ad images. At the time, they only approved images that had no more than 20% of text on the image. However, even though this rule has now changed, and businesses aren’t rejected for having more than 20% text, it’s still a good idea to limit the text on ad images. Images with more than 20% text actually get less distribution in the news feed, and they cost more than images with less text. 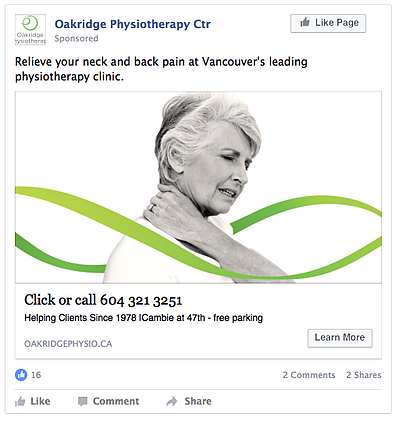 For example, last year, we created a series of four Facebook ads for Oakridge Physiotherapy Centre. Our designer applied the Oakridge wave to all the images. It showcased Oakridge Physiotherapy’s branding really well without adding any text at all. Now it’s time for the final step…. There is no one size fit all solution to social media marketing. Rather than making assumptions about what’s working, you should always be testing. This allows your social media strategy to be backed up by hard data. 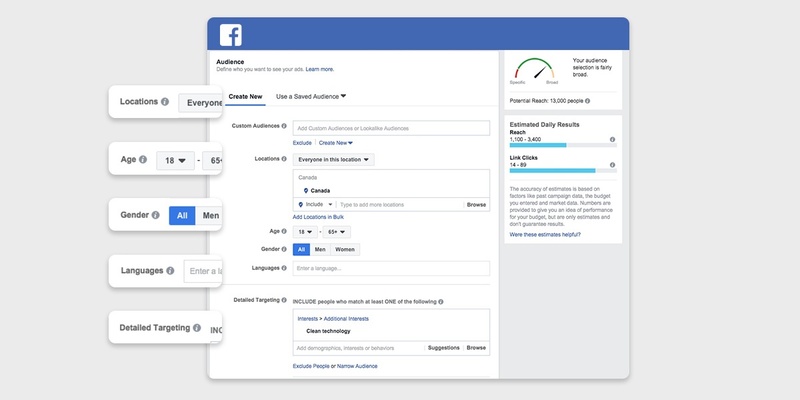 You can test anything from the different types of content and posting times, to the ways you target people with your social media ads. The results of your tests should be analyzed against your Key Performance Indicator (for example, 200 clicks to your website from LinkedIn within the month of September.) 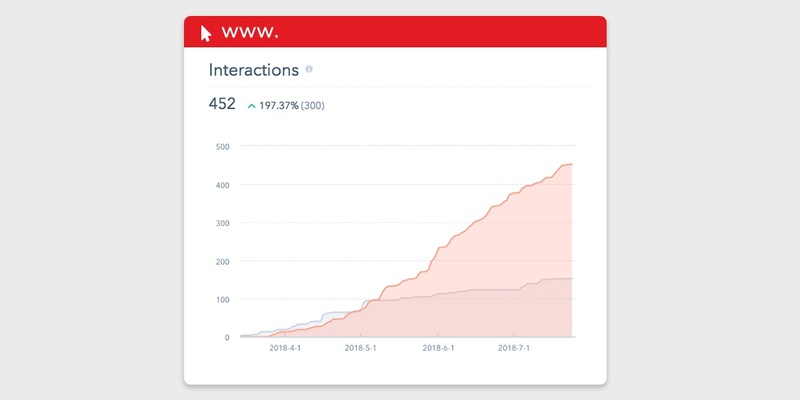 It’s also important to look at other metrics like social media interactions and overall social media clicks to get a better picture of how effective your efforts are. Social media is an amazing blend of science and art. The science side of social media comes from testing, monitoring and analyzing data, while the art side comes from design, branding and copywriting. To be successful in social media marketing, you have to combine them both. I hope this blog has given you some ideas for improving social media traffic to your website. Define the group(s) of people you want to target on social media. Target your prospects with ads that link to relevant content on your website. Make sure to also focus on your organic social media presence, and provide value to your followers by giving them the types of content they want. Make your posts look amazing by adding attractive designs and images. Always be testing to find out which parts of your strategy are working, and which aren’t. Now it’s over to you… What’s your favourite way to use social media for your business? What strategies have given you the most success? Let us know in the comments below.